Members of City Council have been asked to join their colleagues in the County and declare the crisis in housing and homelessness to be an National Emergency. That Cork City Council formally declare the crisis to be a emergency and to ask Government to establish a National Emergency Committee on the issue. 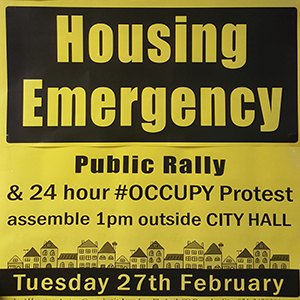 To stand with the ‘Housing Action Group’, and the public, who are launching a 24 hour #occupy style protest at 1pm Tuesday 27th outside Cork City Hall. “I hope that both Council’s in Cork can stand together, declaring an Emergency on the issue and then we can appeal to all other local authorities to join in – such pressure is needed in order to move Government. “Last week Cork County Council called on the Taoiseach to setup a National Emergency Committee on the issue, Cllr Ó Cadhla wants City Council to do the same. Previous Previous post: Possible Sale of Public Land at Ballynoe, Cobh? Next Next post: Recovery of Void Properties!